Project Ex-S stage 1 complete! 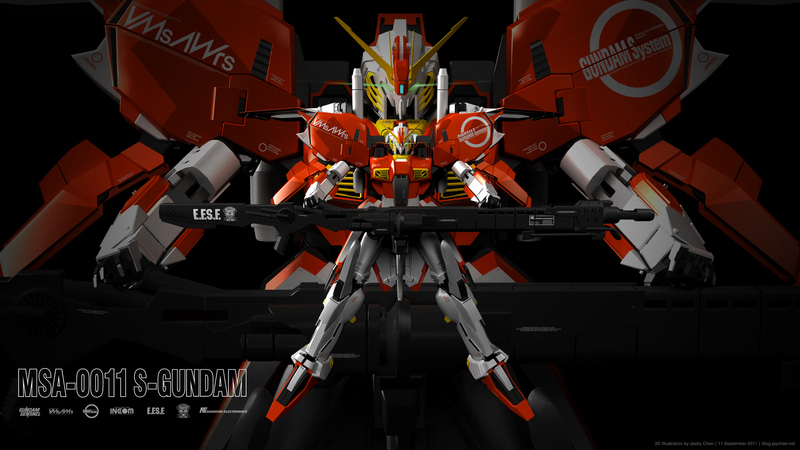 This took longer than I expected but finally, stage 1 S-Gundam 3D model is finally complete! I’m quite happy with the overall result. I paid extra attention to detail and reproduced all the logo’s in illustrator. This time I tried not to stray away too much from the original design like what alot of people tend to do, but instead I tried to accurately remodel the design from the individual parts to the textures. I want it to stay true to Hajime Katoki’s vision as much as possible. I present you the mighty S-Gundam! Click on images for full-size. Probably one of my favourite gundams of all time. What I love about S-gundam the most is how realistic the design is. 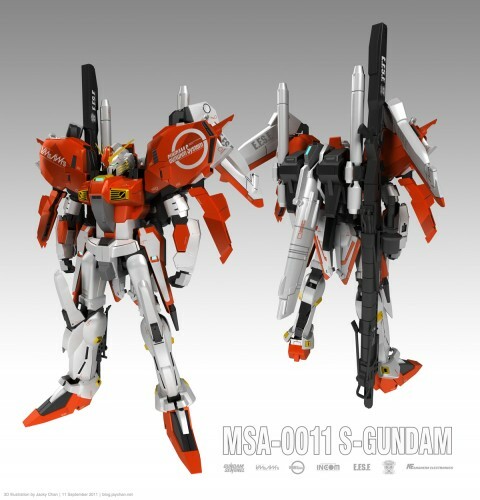 Unlike modern gundams such as Exia and Freedom that uses a form of unique energy source such as the Solar Reactor and N-Jammer canceller respectively, S-Gundam uses traditional rocket boosters and fuel. It’s also highly customisable with the ability to upgrade it’s armour and weapons into what would then be known as the Ex-S Gundam. This project took roughly 2 months but ‘stage 2: Ex-S Gundam’ should be the easiest out of the 3 stages as it’s only some additional parts. ‘Stage 3: Deepstriker’ would be the hardest due to the sheer amount of details but it should be fun!. That model looks absolutely pro. I don’t remember what you modeled back in uni, but you handed this in as an assignment, it would’ve been HD for sure 8D. Two months, hm? That’s some serious work done right there >=Db.